Known as ‘Zimbabwe’s Kruger’, the visitor is likely to be rewarded with comparable wildlife viewing opportunities, but without the crowds of its more famous cousin. Lack of tourist congestion means the Park can be explored at a more leisurely pace – and there is no need for speed-traps on Hwange’s broken tar and dirt roads! 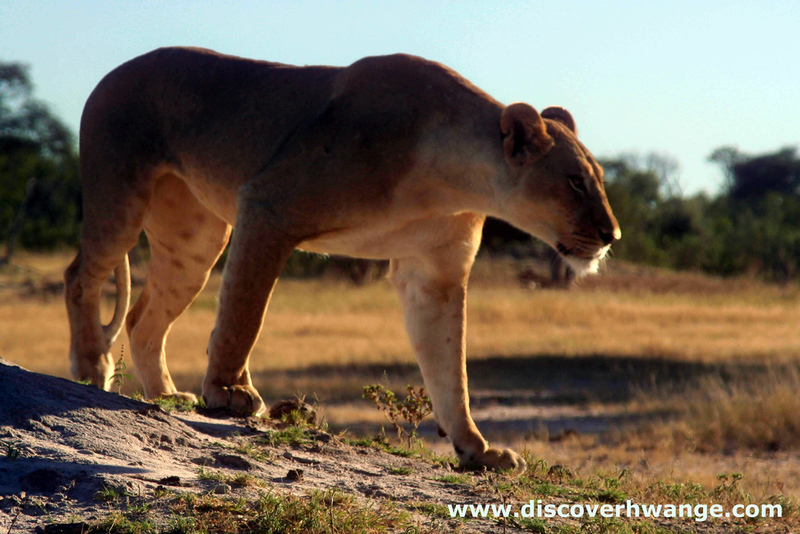 Indeed it is Hwange’s rather forgotten nature which makes it such an appealing and special place to explore. Of the four public camps, all situated in the northern section of the Park, Main Camp is, not surprisingly, the largest and most easily accessible for the independent traveller. In the north-west of the Park, Sinamatella, perched on a ridge with magnificent views across the plain below, and Robins and Nantwich Camps offer more remote but equally rewarding safari options. The north-western Sinamatella section consists of an exposed basalt area, draining into the Deka river system, which holds perennial water and supports a different ecology to the majority of the Park. Much of the central and southern sector is an inaccessible wilderness and rarely visited. To the east of Main Camp are several private safari concessions. These exclusive camps provide luxury safari accommodation and professional guided tours in some of the most ecologically interesting sections of the Park and offer some of the best safari experiences in Africa. 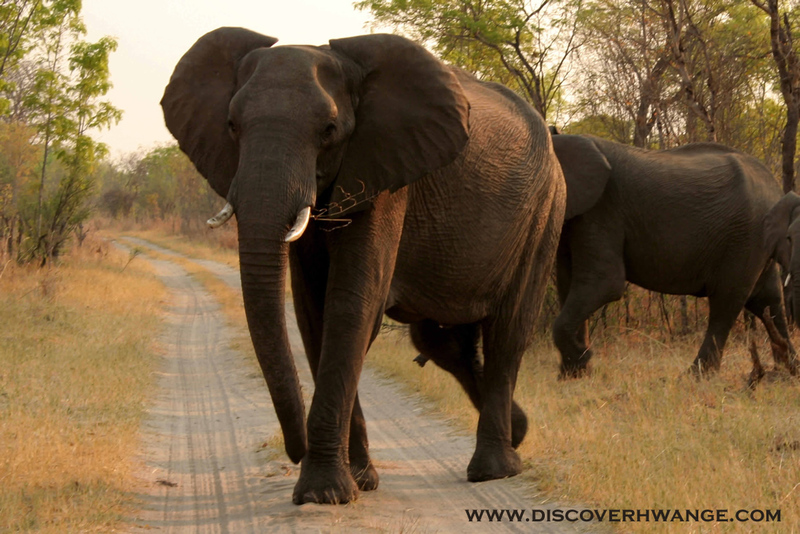 A great way to discover Hwange is through specialist walking safaris with a highly experienced guide. They will lead you on multi-day walks with over-night stops in temporary or seasonal tented camps (with surprisingly high levels of comfort and catering). With every care given to respecting the natural surroundings, they will ensure that your footprints are the only trace you leave behind. Guided walks are particularly recommended in the north-western Sinamatella region of the Park. The landscape of the Park is dominated by Kalahari sand, blown in from Namibia and Botswana and blanketing much of the central and southern sections. The remnants of long east-west orientated sand dunes, stabilized by vegetation, run parallel to each other, some for over 25 kilometres. Here there are no permanent rivers or pans, only fossil drainage lines which have long since lost their waters. During the rains a vast number of seasonal pans develop, hosting a wealth of birdlife. This geography supports a complex mosaic of woodland habitats and open savannah; dense teak forest in the north gives way to grassland in the south. In between, open grassy vleis lined with acacia scrub lie alongside mopane woodland and islands of palm trees. Movements of animals are governed the annual rains and availability of water in a landscape which transforms with the season. During the hot summer rains between December and March the bush becomes thick with growth, surface water is abundant and the wildlife disperses over wide areas. Between the winter months of June and October the bush rapidly dries out and the few waterholes that remain become increasingly important focal points for thirsty animals. Hwange is at its most alluring during the dry season when these pumped waterholes attract large concentrations of elephant, buffalo, giraffe, zebra, kudu, roan, sable, impala and many other species. Never too far away will be the watching eyes of lion, leopard, cheetah or wild dog, waiting for the opportune moment to strike at the weak or unwary. The lions here are known to bring down elephant given the opportunity. Despite the appeal of game viewing during the dry season, Hwange has much to offer throughout the year. The summer rains transform the Park into a verdant landscape, and although game animals can be harder to find, a trip at this time of year can be equally rewarding, especially for the enthusiastic birdwatcher. Shallow depressions become water-filled pans, supporting beautiful water-lilies and a multitude of wetland birds including ducks, waders, herons and storks. Arid dusty plains are transformed into fields of grassland, attracting an enormous influx of migrant and nomadic birds. Brilliantly coloured bee-eaters and rollers abound, providing a challenge for the photographer. Whatever your safari dream, Hwange can deliver. From lounging in luxury camps overlooking a waterhole; taking a back seat on your game drive whilst searching for the 'Big Five'; or 'roughing it' in the bush on a walking safari. It is also a place which will demand you return, as many people do, time and time again, to explore and experience the wonder that is Hwange. The Park has a rich cultural history, originally inhabited by nomadic bushmen and home to iron-age cultures including the Nambya (descendents of the stone builders of Great Zimbabwe), the Park was also the royal hunting ground of the first Ndebele king, Mzilikazi. The Park takes its name from Chief Wange, the dynastic title of the Nambya people. The Nambya, who traditionally inhabited its northern regions, have many sacred sites scattered within the boundaries of the reserve, including the remains of their old capital, the Bumbusi ruins, which date from the 1830s. The old north road used by early European hunters and traders, avoiding Ndebele territory through which they required the king’s permission to travel, forms the eastern border of the park, and the international border between Zimbabwe and Botswana. In these early days the wildlife did not escape the attentions of the big game hunters. During the late 1800s and early 1900s many hunted here, including Frederick Courteney Selous who favoured its northern areas. In 1873, whilst camped on the Dete Vlei near today’s Sikumi Tree Lodge just outside the boundaries of the Park, Selous recorded the last white rhino to be seen in the area before their re-introduction to the Park in the 1960s (they are now again absent from the park as a result of poaching). In fact much of the Park's wildlife was hunted out before the area was finally gazetted as a game reserve in 1928. It was over two decades later, in 1949, that the National Parks Act upgraded Hwange to the status of a fully protected National Park. Ted Davison, the visionary warden who oversaw the Park’s early development from its conception to the early 1960s, realised that water was the key factor governing animal populations in his new reserve. In 1939 the first boreholes were sunk in order to feed what was to become a network of roughly 50 pumped pans providing artificial water points throughout the northern section of the Park. For wildlife viewing and safari options, the later dry season (August-November) is traditionally favoured, when animals are often drawn to the pumped water pans and the bush is relatively thin. During the rains the bush is transformed into a lush verdant paradise, making game viewing more challenging, but potentially rewarding, as it is the birthing season for many game species. There’s also a wealth of birdlife. During the wet season though, local advice should be sought as to the best routes, as many roads are suitable for 4x4 vehicles only during this time of year. The core routes around Main Camp are suitable for non 4x4 vehicles all year round, although the standard of all roads within the park is highly variable. 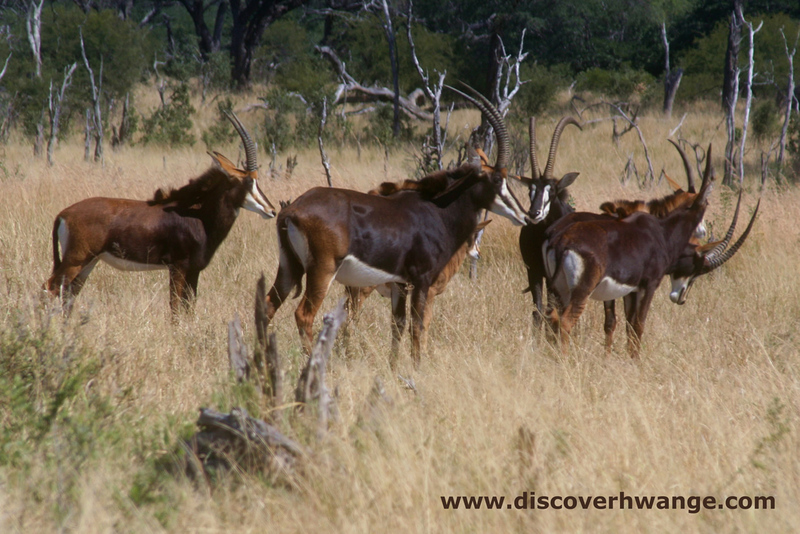 Hwange National Park’s abundance of wildlife is not purely down to nature. Although in the wet season Hwange’s undulating landscape becomes a mosaic of thousands of temporary wetland pans, marshes and flooded areas, the dry season hits Hwange hard. Seasonal pans dry out and very little natural permanent water is available to support animal populations throughout the vast park. Over fifty boreholes have been established in Hwange, many of these are still operational and maintained by dedicated Zimbabwe Parks and Wildlife Management Authority staff with the assistance of tourism operators and conservation organisations. The pumps are driven by diesel engines which can pump in the region of 50,000 litres of water a day. Wilderness Safaris, who manage over twenty pumps on behalf of the Authority, have been experimenting with modern efficient engines and have had some success with environmentally-friendly alternatives. However, solar and wind-powered engines struggle to pump the huge volume of water required to maintain water levels in pans throughout the dry season. Many of the tourism operators not only assist the Park and its wildlife directly through management of boreholes close to their lodges, but indirectly by supporting charities and projects which support the wider conservation and management of the Park. Organisations such as Wildlife and Environment Zimbabwe, Friends of Hwange Trust (which was established in 2005 in response to the extreme drought that year), the Hwange Conservation Society, SAVE Foundation and African Bush Camps’ H2O Hwange campaign all support the Park Authority with water management across the Park as well as other operations such as anti-poaching and snare removal work. The provision of drinking water is also a challenge for tourism operators who need to provide for thirsty clients. Plastic mineral water bottles can leave huge environmental footprints, from the impact of transportation to disposal problems. Wilderness Safaris, together with other operators such as African Bush Camps, have installed on-site filtration systems which allow their lodges to provide safe, clean water to their clients. Tourists are also given reusable bottles for them to refill during their stay, significantly reducing the need for disposable plastic bottles and their associated environmental problems. Tourists are encouraged to be aware of their environmental footprint whilst exploring Hwange, and to take steps to minimise and offset the impacts of their visit by supporting any of the projects or charities which operate in the area.